Hello my lovely people how are you all? As you can tell from the title, I’m sharing with you my current night time skincare routine. As a woman in her 30’s your body goes through changes and so does your skin which means your routine needs to reflect its’ needs. I remember going to a skin care event and an aesthetician, who was one of the speakers, said that she does not treat her client’s skin according to their age but, according to what their skin needs. I was searching for products that addressed my needs which included, visible pores, uneven skin tone, redness and some dryness. Whilst searching for suitable products, *Simon & Tom asked me if I would be interested in trying some products from their Hydra range. Since I’ve used their face masks I jumped at the chance to try their luxury range and created a night time routine. My first choice was the soft peeling gel which is described as a gentle exfoliator and enzymatic peel. My first impression was that it looked like jello with a similar texture. When I applied it to wet skin and rubbed gently, it creates little gel-like balls. My skin felt soft and did not irritate my skin in any way. It’s almost like the enzymes in the gel created a smooth canvas yet, respected my skin’s moisture balance. I now use this most nights, especially after makeup removal. My go-to night moisturiser has been Rosehip seed oil however, I wanted to try something that contained hyaluronic acid. This Simon & Tom night cream is a dream! My skin feels moisturised but not greasy and seems to work in tandem with the soft peeling gel. This cream also contains argan oil and argan stem cells which help to penetrate beneath the surface of your skin. Not only does it help with the dryness but, also any minor wrinkles that have started to appear. All in all, I really like these products and will continue to use them until they’re finished. I keep my night time skincare routine really simple because I don’t always have the energy for complex steps late at night. 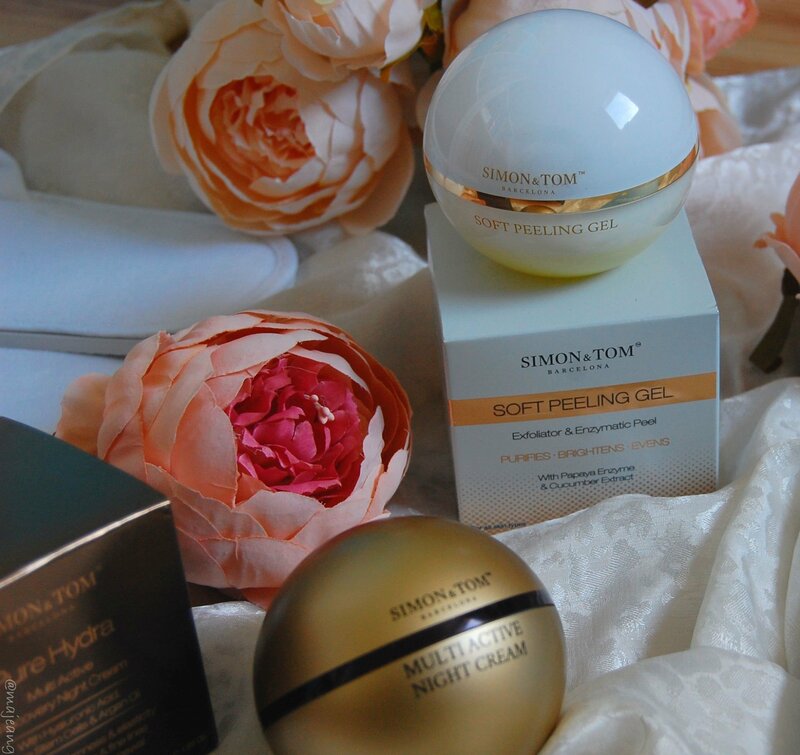 Have you tried the Simon & Tom range before? What do you use for your night time routine? Let me know in the comments below. If you haven’t signed up to the newsletter as yet please do! Thank you for reading and until next time, be well! *PR samples used in this post. Thoughts and opinions are my own.